Growing up in the cool elevations of the Jos-Plateau, near central Nigeria, the sight of healthy looking, nutritious sweetpotato roots with diverse skin color was an inheritance nature afforded me. In the markets, they were usually displayed in cleverly crafted little pyramids for sale. Often, these nutritious roots made their way to my family’s table as food. Occasional visits to the village canvassed on my young mind an understanding about food production, and I witnessed first-hand, the challenges faced by farmers. These experiences perked my interest and quest for knowledge in agricultural development. My enthusiasm continues as the current focus of my PhD research. For so many rural homes in West Africa, sweetpotato remains an affordable food and its orange-fleshed varieties are a rich source of betacarotene to fight against vitamin A deficiency. It is also a source of income as fresh roots or processed products. Sadly, as is the case with numerous crops, drought has devastating effect on it. My PhD research involves identification of traits associated with tolerance to drought. 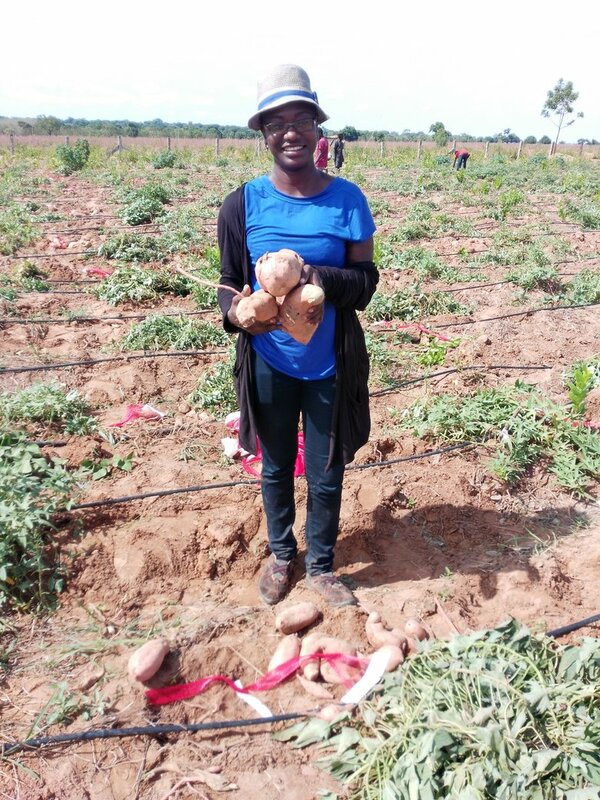 Together with the Genomic Tools for Sweetpotato Project team, the International Potato Center (CIP-Ghana) and the West Africa Center for Crop Improvement (WACCI), we are hopeful that research findings will contribute to faster and efficient ways of improving and breeding sweetpotato varieties tolerant to drought challenges. As a young woman in science, I draw my inspiration from women scientists who continue to devise ways of improving and modernizing agriculture in the region. Women are at the core of food production and they contribute significantly towards a healthy and vibrant society. However, despite their contribution, they remain invisible actors in food security discourses. Deliberate efforts to include women in policy and decision-making processes of agricultural production are key. Platforms that enable young women scientists to network and harness their research, leadership and public engagement skills is a great way to build and empower women towards contributing to food security in Africa. In preparing me to meet the demands for my PhD research, my experience with BecA-ILRI Hub and ISAAA AfriCenter was remarkable. The opportunity provided needed skills in data management and science communication. Learning the essentials of effective communication, especially to a non-scientific audience, has helped me to be more reflective on ways to communicate about my research. The chance to meet with other women in science enabled networking and learning from each other. Seeing these women strive towards their goals has been a motivating factor in my studies and career in science. Women need a seat at the decision making table. Efforts to enhance their capacity towards that end should be intensified.